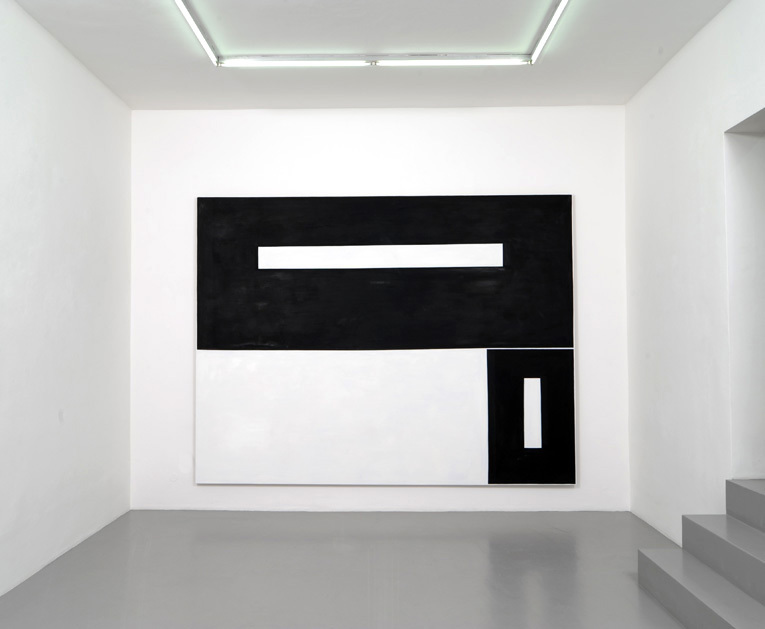 From April 14 to May 19, 2012, the Galerie Christine Mayer is showing two new paintings by the artist André Butzer (b. 1973 in Stuttgart), who lives in Rangsdorf, Brandenburg. This is the sixth solo exhibition by André Butzer at the Galerie Christine Mayer since 2002. Since the mid-1990s, Butzer’s work has been characterized by an exclusive grappling with the medium of painting, with his history, and with its capability for abstraction. In the 1990s the artist strove for abstraction as the inevitable path for the possibilities of painting and confronted his action, which took as its starting point the tragic framework in the painting composed of the figure in space, and only later with its simultaneous extinction and destruction by producing monochrome gray and black paintings. The latter paintings came to thematize the now absent representation in order to finally make room for an intensification of the actually present in favor of the “holy” plane—that is to say, in favor of the autonomy of pictorial means. Those paintings could be said to be spectacular because of their extraordinary materiality, impasto, and his quasi–signature style of employing the paint tube or the neck of the paint tube, which Butzer used to create pseudo-geometric lines in the paintings like electrical cables. By contrast, toward the end of the last decade, or around 2010, a new type of painting emerges in which Butzer, seemingly taking a step backward, translated those lines back into bands painted with the brush, which together form the plane. On the occasion of his exhibition at the Kestnergesellschaft in Hanover in 2011, titled Der wahrscheinlich beste abstrakte Maler der Welt (Probably the best painter in the world), such paintings, which soon came to be called N-Bilder (N paintings), were exhibited for the first time, including Ich will erstmal ’ne Cola (First I want a cola), which is four and a half meters tall. This painting evokes and reconfigures on its own authority a basic constellation of history painting, namely, the proportion of the vertical or horizontal that is like a pictorial relationship of life and death. The paintings and exhibitions that followed continue this program, although the gray grounds or planes of the paintings developed into blindingly bright, almost white shades, which, however, still accommodate, in a concealed way, the three primary colors as well as diverse flesh tones. The black bands did not come together into boxlike or beamlike forms, in a senselessly constructive or concrete way. Rather, freed from the preconceived grid—which Butzer vehemently rejects, as he does internationally established geometry—they floated in pictorial space, which became a threshold. In parallel with the colorist escalation to white, there was a simultaneous escalation of black, which swelled, in an almost threatening way, filling the paintings and bringing the color relationships into an asymmetrical balance in the painting, in the tradition of Piet Mondrian. 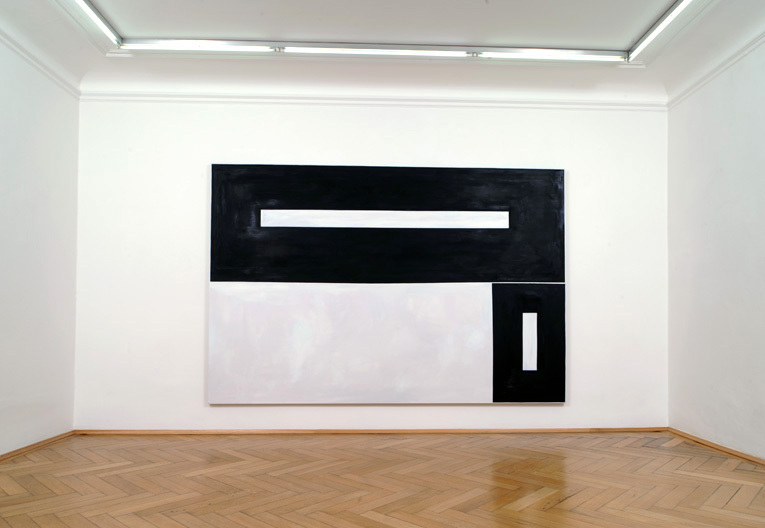 The two paintings Untitled, 2012, and Untitled, 2012, in the current exhibition in Munich now seem to represent a provisional culmination of this process, though this process as such probably cannot be concluded at all. Color, contrast, compositional structure, and pictorial unity are now brought to bear in an extreme way. The paintings rise up against mundane, geometrical laws with their artistic, even coloristic “geometry,” which does not obey any scale but rather constantly reestablishes scales and leads them to destruction—i.e., to N itself—in the same pictorial place and even in the same moment of observation. Pulsating, round, curve, wavering, and moving, similar to a deadly frequency, the observers perceive how such a coloristic proportion becomes a matrix without a motif, that is, the future birthplace of Butzer’s painting.